Despite his success as a professor, Campion was not to be long departed from his native land, for, in 1580, he returned to England, disguised as a wealthy merchant, and worked for a year as an itinerant priest to English subjects who courageously held to their Catholic faith amidst violent persecution. During that time, he also wrote "The Challenge to the Privy Council", or "Campion’s Brag", that directly disputed state-wide rumours that the mission of Jesuits in the realm was in fact seditious and a key component in a larger Catholic plot to overthrow its excommunicated queen, Elizabeth I. Both the life and the death of St. Edmund Campion engenders for many a great admiration and offers us two very important points for our own prayer. First, not only in life was he blessed with superior intelligence, extraordinary communicative skills, and worldly favour, but more importantly with the courage to follow Jesus Christ into a faith that, if embraced at that time, was fraught with danger and the need for personal sacrifices. Though the challenges which come from following our Lord today may seem far from dire, still, deep in our hearts, Jesus is calling each of us to something. His loving will beckons us on, so that perhaps we might pray with Campion for the courage to embrace that will when it somehow becomes known to us. Second, in his death, the saint reveals, how more important than riches, honour, or glory is the love that we have for Christ. Since, on that cold day by the Tyburn, Campion did not embrace death, but rather the Son of God. Fr. Michael Knox, S.J. is presently doing graduate studies at Campion Hall, Oxford. Haydon, Alexander. Edmund Campion. London: Catholic Truth Society, 2003. Holleran, James V. A Jesuit Challenge: Edmund Campion’s Debate at the Tower of London, 1581. New York: Fordham University Press, 1999. Martindale, C. C. Blessed Edmund Campion, London: Catholic Truth Society, 1964. Waugh, Evelyn. 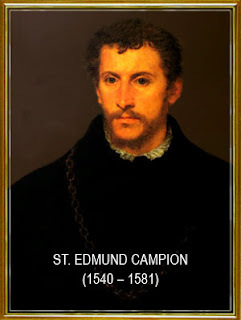 Edmund Campion. London: Cassell, 1987.